PanTerra Networks offers a rich selection of features across multiple plans, fit for any growing business that needs scalability, and to streamline operations. 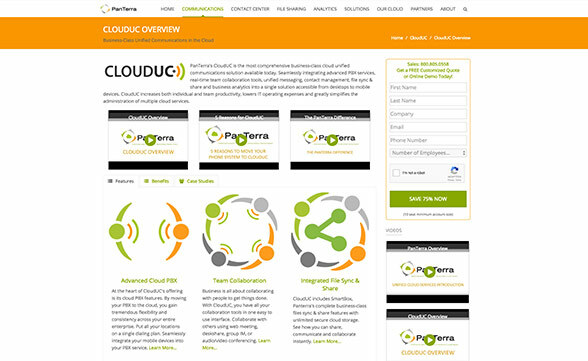 PanTerra Networks provides a feature-packed suite of cloud-based communications that goes above and beyond traditional VoIP services. Even the most basic plan still offers a little bit of the file sharing, mobility, and contact center solutions that growing businesses need to streamline operations. All of that is in addition to the core product, which is an enterprise-class VoIP communication platform. With all the added features that get rolled into the various plans, your company would need to buy into multiple cloud-based services and subscriptions. While there’s no direct pricing available on the website for PanTerra Networks’ plans, the amount of bundled features and services provides a great deal of value. Even with the most basic business phone plan, you still get unlimited calling, unlimited call recording, 3rd party integration, 2GB of storage, mobility and softphone access and secure chat features for a simple and likely affordable unified communications package. There are four plans available from PanTerra Networks that pretty much guarantee a scalable solution you can rely on as your business grows. From a simple 20-person law firm to a 2,000 person hi-tech enterprise, the business-class unified communications plans can be perfectly matched to the needs of your operation. As you grow, plans can be switched or features added as needed. Traditionally, VoIP services are relatively easy to setup and configure. With a cloud-based system, like PanTerra Networks, you simply need to set up the phone equipment at your place of business. 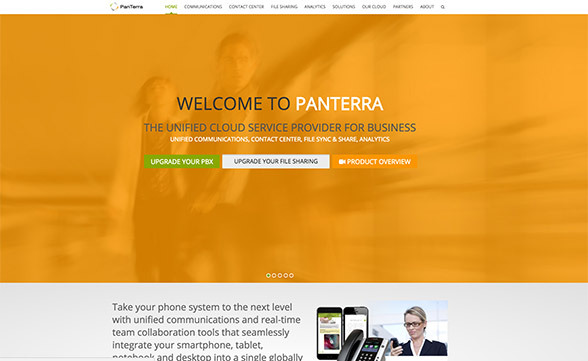 The phones come pre configured for PanTerra Networks, so there’s little for you to do there. If you’re tech savvy, or have handled VoIP system installations like this before, it will be a breeze. There were a number of reviews online praising Panterra Networks for all their service and features, only to lodge small complains that the installation and setup of the phones was a bit of a headache and seemed like it should have been easier. Similarly, some users have found that the administrative dashboard is a bit cumbersome and it can be difficult to learn. This can be somewhat expected when you have a unified communications platform. You’re no longer just dealing with call groups and extensions, but an entire system of communications, integrations, contacts, chats, analytics and more. Expect it to take a little extra time to learn the back end of the system – but once you know it you’ll find your operations much more streamlined over having to work between multiple cloud-based programs to do the same tasks. PanTerra provides an impressive support system for its customers, operating off its own proprietary unified communications platform. This allows the company to interact and support customers through a variety of channels including voice, IM, email, and deskshare. It’s a testament to what you can do with the service when they use their own platform to support their customers. That support is also available 24/7/365, with a 30 second guarantee on response time so you never have to wait in a call queue when trying to reach someone. Beyond standard support there’s also an info-packed knowledge base with tips, guides, how-to’s and relevant articles as well as end user training and help documentation. Mobility is first-class with PanTerra. The company includes a softphone that can be used with any PC, eliminating the need for a phone hardware. Likewise, mobile users who work in the field or on the go have access to the proprietary custom mobile app. 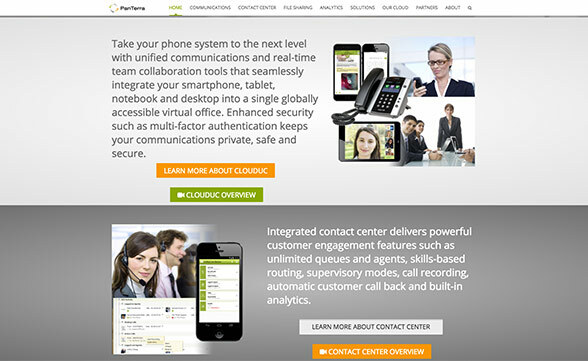 This gives users access to the unified communications from any mobile or smartphone device. It’s the perfect bundle for mobility, and both are available under any one of the listed plans offered by PanTerra. PanTerra Networks is an impressive unified communications platform, offering enterprise-class services to growing businesses with some impressive features and value-added benefits. From unlimited calling to top-tier customer services and extensive mobility it’s a great investment with a lot of scalability. There’s a potential learning curve with such an extensive system, and it’s not ideal for small businesses and startups, but it’s a worthwhile investment if you need all the tools it offers.